New Painting for my son! Ok, so Nick moved out a couple of months ago. When he moved I promised him a piece of art for his new apartment... well I finally finished it! Nick is a poker dealer, so it had to be poker related. But I didn't want it to be your average poker art... dogs playing poker, cards running. Ok, so I painted what I'm calling Nick's forest. 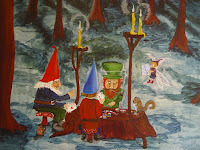 It is 2 gnomes, 1 leprechaun, 1 fairy and a squirrel playing poker in a forest. The whole painting and a close up of the game, what do you think? I hope he likes it I'm taking it to him this afternoon!!! 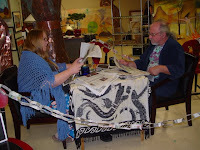 Also, here is a photo of Joe and I doing our performance art piece for the newspaper show. It was fun... sitting in a public place in our jammies felt kind of funny at first, then we got into it! HA! Notice the newspaper chain that blocked our piece off. 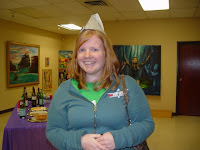 Here is a photo of my daughter Lindsey wearing a newspaper hat, and a photo of me with my art hanging on the wall. 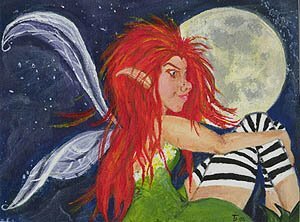 Ok, not only am I going to be showing my art but... drum roll... I am going to be doing a performance art piece along with my hubby. And NO we are not playing music! Hum... guess you'll just have to come out and see! Here is the postcard for the show. Hope you can all make it! 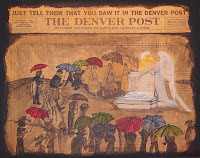 The Marco Fuoco Gallery presents The Demise of the Newspaper. An artist view of changing times. Marco Fuoco Gallery Second Saturday Reception, April 11, from 7 pm to 11 pm. 6764 Folsom Blvd Sacramento. I will have 3 pieces for the show. 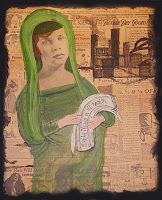 My Newsie, posted below, and also Madonna, and Weeping Angel. They are all, acrylic on old newspaper on canvas board. All will be framed. 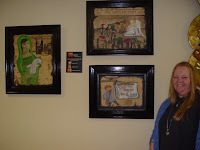 The show runs through May 5th. It should be interesting to see how the participating artists interpreted this one! 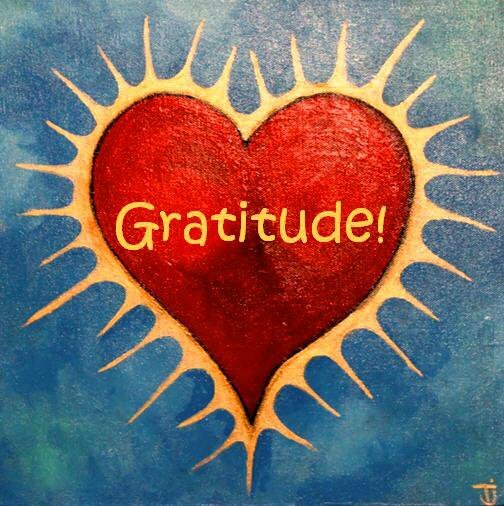 Be well!!! Tj. The Demise of the Newspaper. More Newspapers are going digital every day, stopping the old print that was always waiting for you on your front stoop in the morning. This show is all about that! Should be interesting to see what the artists come up with. And I think there will be a performance art piece too... someone sitting and reading the paper! HA! I was the happy recipient of some old, very old newspapers from 1917. My dear father in law parted with them in the name of art... well and he knows how I love anything old! Some of it was not in the best shape, so I used it as a background. 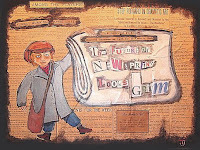 I have 3 pieces, this is the first... titled "newsie". Be well... Tj.